Freshwater ghost shrimp from the Palaemonetes genus, also known as glass shrimp, are hardy shrimp often used as feeders due to their low price. However, they're also easy, fun additions to the aquarium and a great choice for anyone looking to gain some experience in shrimp keeping. Keep reading for everything you need to know about ghost shrimp care and keeping ghost shrimp in your aquarium! Scientific name: The common name 'ghost shrimp' is used for the various shrimp species in the Palaemonetes genus. So not all ghost shrimp are the same! As mentioned above, ghost shrimp are not difficult to keep. They don't require a specialized aquarium setup and a tank of at least 10 gallons (38L) should be large enough to sustain a colony. As always your aquarium should be filtered and fully cycled before any shrimp are added. Although ghost shrimp can handle a relatively wide temperature range it's a good idea to always use a heater to prevent sudden temperature fluctuations. 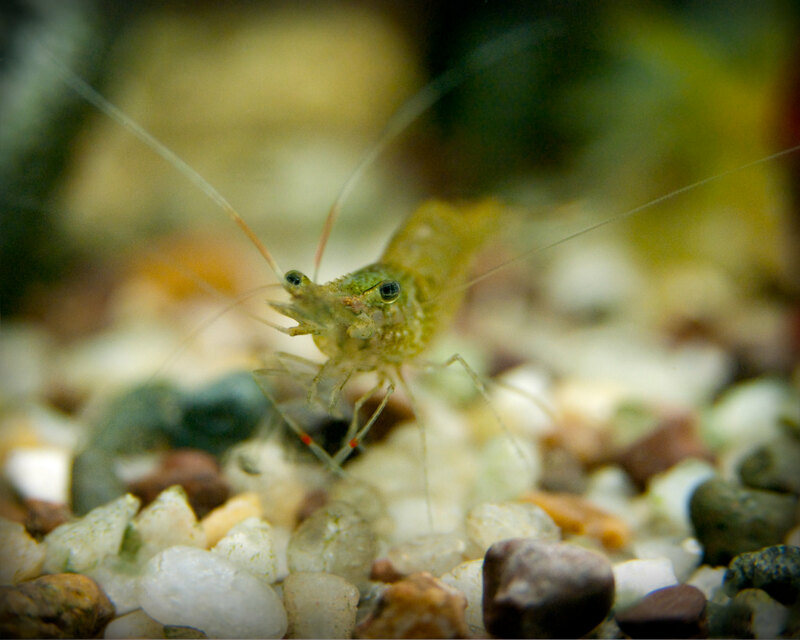 Like all shrimp, ghost shrimp can become skittish if the aquarium lacks hiding places. If you want to see your shrimps' natural (foraging) behavior be sure to use plenty of plants and hides. One of the reasons ghost shrimp are so popular as feeder shrimp is that they are quite hardy and can handle bad water quality fairly well. This makes it easy to ship and house them in massive amounts; after all, if a few die it's not like a lot of money is lost. Obviously things are a little different if you keep these shrimp in your aquarium. If you want them to live a long and happy life it's important to keep the water quality high. That means the tank should always be fully cycled (zero ammonia, zero nitrite and nitrates as low as possible). Overstocking is not much of a worry if you only keep ghost shrimp, as their bioload is very low, but it's something to keep in mind if you're going for a community tank. Room temperature is fine, but as discussed above it's a good idea to still use a heater as backup. Because they are a little larger than dwarf shrimp there is a little less risk of your ghost shrimp being eaten by their tankmates. That being said, you should still avoid keeping them with any fish that might have an appetite for shrimp! Peaceful tankmates are a must for any shrimp. If you're interested in actively breeding your ghost shrimp you might want to consider setting up a single-species tank, as the larvae are very vulnerable. Keep in mind that ghost shrimp are known to be slightly more aggressive than dwarf shrimp. Fish with long fins, such as Bettas, might be damaged by these opportunistic feeders. 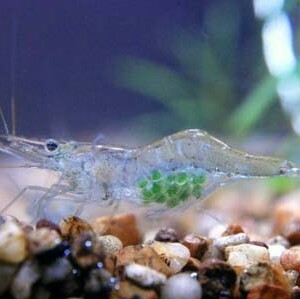 One of the reasons ghost shrimp aren't just appreciated as feeders is their diet. These shrimp are omnivorous scavengers that will eat pretty much anything they come across! This, combined with their low bioload, can make a group of ghost shrimp the perfect aquarium 'cleaning crew'. They will consume leftover foods, decaying plant matter, algae and anything you give them. If your aquarium is very clean your ghost shrimp likely can't find enough to eat by themselves. You can supplement their diet with anything from algae wafers to frozen foods such as mosquito larvae. Breeding ghost shrimp is a little different from breeding ghost shrimp. These shrimp don't hatch as miniature versions of their parents but go through a larval stage during which they are very vulnerable and easily (accidentally) damaged or killed. To breed your ghost shrimp, set up a single-species aquarium with a sponge filter. Make sure your shrimp colony contains both males and females and plant the tank heavily to provide the larvae with a place to hide and feed on infusoria and biofilm. Make sure your water values are perfect and you should soon start seeing females carrying small green eggs between their swimmerettes. That's it! You probably won't see the larvae much after they hatch but they should come out of hiding once they're large enough to feel safe out in the open. Ghost shrimp are one of the most common shrimp species in the aquarium hobby and you shouldn't have too much trouble finding them. Because they are often used as feeders you might be able to find them at your local pet- or aquarium store for a low price, but keep in mind that these shrimp might not be too healthy. Because various species from the Palaemonetes genus are sold in aquarium stores as juveniles there's also a chance you'll end up with shrimp that require brackish water or grow very large and rather aggressive. You can also 100% healthy freshwater ghost shrimp that don't turn into huge monsters (Palaemonetes paludosus) at The Shrimp Farm with live arrival guarantee. Just click here to buy your shrimp!